Dubai: it's me! in the UAE! : the quest for groceries. 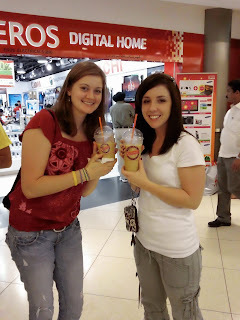 Today we ventured to the Diera City Mall to find phones and food. After shopping around we finally picked out some phones at this one store. We ended up buying 5 phones from that store, they were siked. So now the phone I have is a classic ghetto old school phone with no camera, no internet, two games, and a built in tiny flashlight, and it's awesome. We walked around the mall for a while. Me and Dylan wandered off at one point and ended up getting to the center stage in the middle of the mall just in time for the traditional Emirate performance that was being performed for UAE National Day. There were really cute kids dancing around and all the people were in classic Emirate dress and stuff. It was cool to watch. I got some great videos of it. Eventually we found the Carrefour, basically the food store, clothes store, stuff store, crazy store, Walmart kind of thing that is included in the mall. We all had to get different stuff so everyone went in search of their needed items. There were people everywhere. I think it’s partly because it was there 4th of July and it was the weekend and it’s a ginormous mall. Let me tell you, it was nothing like the lovely shopping experience at Wegman’s. I was just wandering around looking at the prices and watching different people. I only ended up getting granola bars, jelly, bread, apples, yogurt, shampoo, and conditioner. I figured that would at least get me through this week. It was too crazy to go in search of anything else. Plus, I was kind of tired haha. Men playing some traditional UAE music. Emirate kids performing for UAE National day weekend. Dunkin Donuts in the mall!